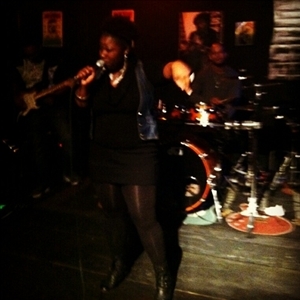 Ebony evans is a Singer,songwriter poet and actress. Ebony is a member,of the first graduating class of the prestigous KIPP Ujima village academy. Ebony has many awards in theater, social studies, language arts and creative writing. Ebony is a proud member of Alpha Nu Omega Sorority Incorporated and she holds the positions of parliamentarian and booking manager on her campus.Ebony is also a graduate of western high school and a sophomore urban arts theater major at Coppin state university. Ebony is a member and the vice president,of the coppin players which is a group of urban arts majors who serve the community, perform in the plays, design the set and work as the stage and tech crew.Ebony has performed for various organizations including sunshines models on wheels, Coppin state university,KIPP academy and artist platform;Cre3sol which is a platform for local artists in and outside of Baltimore to perform. She's also performed all over Baltimore for many different events.Ebony is very active in the community and a member of the Baltimore City Youth Resiliency Institute.Ebony is very driven and has a,promising future, dedicated to her music and poetry, serving the community, working with youth, and spreading love.